The Biolan Eco 220 L hot composting bin is suitable for domestic loading. This compost bin is heavily insulated to enable composting right though the winter, even in Finland. It has a patented adjustable air intake system that allows the user to control the temperature of the compost within and also to draw air up through the compost pile. General tips on using the Biolan Eco domestic compost bin. If you use biodegradable bags, empty the compost and put a bag of compost separately. Always cover the waste with some compost bedding.About 1/3 to 1/2 the amount of the waste. If the waste is wet use more bedding. Small frequent amounts are better than a large amount once a week. Try to add waste to the compost bin several times a week. This is important especially in the cold season. 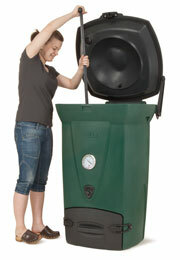 Monitor the composter’s temperature and air supply for best results. When the compost temperature is much higher than the outside temperature, open the inlet air valve knob to the right (100 position) to allow more air in. If compost is cooling close off the air intake until temperature is stabilised. Place the Biolan 220 Eco compost bin in a place where waste can be easily added throughout the year. Ensure that the position is not going to be in standing water during periods of high rainfall. Place the compost bin on a flat piece of ground or tilted slightly backwards by lifting the front edge a bit. There is a seep liquid outlet at the back of the unit at the bottom for any excess liquid. This liquid can either be collected or discharged to ground if conditions allow. If the compost mass is unusually wet, seep liquid can drain through the hatch at the front. Put about 20 liters of Biolan compost bedding on the floor of the compost bin. Turn the inlet air valve knob to the left. When starting to compost use the recommended amount of compost bedding each time you add new material. Over time you will be able to use less. The composting process starts when the waste is at the level of the upper air inlet. Composting activity will generate heat so that the internal temperature is higher than the external temperature. The regular addition of new material will maintain the activity and therefore the high temperature. The compost bin is insulated to ensure the microbial activity is retained. The compost bin’s temperature will vary from 10 – 70°C. A very common temperature gauge is 30 – 40°C. Please note the location of the thermometer at the upper air pipe indicates an indicative stage of composting and the hot phase temperatures. The hottest area is the center of the compost, which the thermometer can not reach. High temperature tells the lively microbial activity and therefore breakdown. The lower the temperature, the slower the composting taking place. A well-functioning waste composter will break down, with the exception of citrus fruit or egg shells, which may be further degraded in 5-8 weeks.